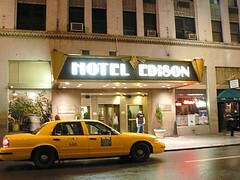 The Hotel Edison is my favourite place to stay in New York. It is always busy and wonderfully located just off Time Square. And the Cafe Edison, next door to the main hotel entrance, is a great place for a quick bite to eat whether you are a guest or not. 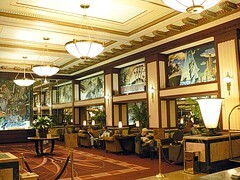 The Edison was built in 1931 and while the rooms no longer have deco features the lobby has been restored and looks fantastic. 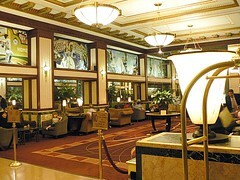 Wow, that's nice, I'd want to hang out in the lobby. Visiting your blog is like a world tour. I never know where I'll be next. Love it,.